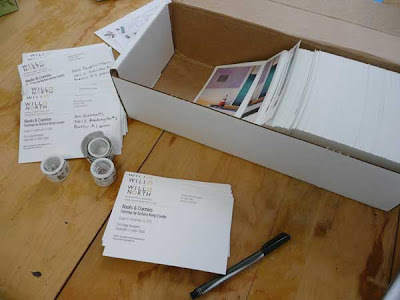 In several previous blogs, I've talked about what it takes to get a piece of artwork out the door, into a gallery, and last but not least, seen by someone other than the immediate family and close friends. One of the traditional ways of doing this is through postcards. Of course, a postcard doesn't just drop off of the nearest tree. First comes the decision of what painting (or paintings) to put on the front of the card. Hopefully, it will attract the recipient's attention enough to flip over and read the details. The wording on the other side of the card is generally just the basic facts about the show. If you've never tried to do this, you'd be amazed at how easy it is to goof up an address, a date, a time. Even when other people proof it, it's always a relief to receive the printed card and see that all is okay. I should have mentioned that one of the first steps is to choose a company to do the printing. In my case, friends Pat and Jacob recommended a printer I hadn't used before. It's important to know who's doing the printing, because different companies have different specs for getting images and text ready to be printed. I'm lucky that husband Jim is an expert at all things technology, so he did all of the technical preparations for me. Voila! Off the information flew over the internet and landed at Got Print. After a few days, I received a proof via email. I noticed a few items I wanted to change on the text side. After doing this, about a week or so later, a box of 1000 cards arrived via UPS at my door step. I am very pleased with the quality of the printing. With the postcards in hand, I proceeded to work on my mailing list. This is another of those time consuming yet important jobs artists need to do. A good mailing list is critical. It's made up of friends, acquaintances, collectors, people who have signed guest books at shows, business associates and others. At 28 cents per stamp, it's important to have accurate and current addresses. Next step, getting the stamps. An easy yet painful ($) part of the process. I like to hand address my cards rather than print out labels. It seems more personal, plus I get a chance to look at the list again to catch errors or do some last minute eliminating or adding of names. It's slower but it works for me. Finally, the postcards are sent off to their destinations. This time I remembered to get my return address printed on the cards. Any that come back to me can then be corrected on my mailing list. What happens to a card when it reaches its destination? Well, I don't know, but I hope at least some people look at it and are intrigued enough to come to the opening or check out my website. Mostly, I'll never know. Oh, I want one, I want one [waving my arms up in the air]. I love your work, so I'm signing up by sending you my snail mail address. Your postcard is making it's way via snail mail from Oracle. You should have it in a few days (?) unless the snail gets lost or stuck in its' own tracks. Yesterday I compiled Robrt's and my mailing list and got together a good hundred post cards in the mail with the aid of Kristin's postage meter. Todd has taken on the task of taking the cards all around town, from cafes to libraries to ASU. He has a list of about 20 spots, so there will be a good deal of buzz. It's fun to see everyone pitching in and helping to make this a successful first Friday. I got my postcard today! I love it--I'm looking forward to seeing it in person. Meanwhile, the postcard will be in a place of honor on my refrigerator. Barbara, thanks so much for the postcard invitation to your Nooks & Crannies exhibition! Regretfully I will not be able to make the show but wish you much success. Lovely work! Good job.